Property taxation is a key element in providing a solid foundation and a stable funding source for basic public services. Developing and implementing a property tax system is a complex task. This complexity is compounded by the diversity of legal, cultural and historical contexts of policymakers and tax administrators. The World Development Report (1999-2000), Entering the 21st Century puts fiscal decentralization at the top of the development agenda. This makes local taxation - and especially the property tax option - of critical importance to both tax and land policy, as well as the broader development agenda. A Primer on Property Tax: Administration and Policy provides the reader with an analysis of issues surrounding property tax, including economics, law, public finance, decentralisation, valuation, GIS and property tax reform. A key strength of the book lies in the vast international experience of the authors and the book will provide for the first time material which is topical, cutting-edge and highly relevant to many of the disciplines involved in property taxation. 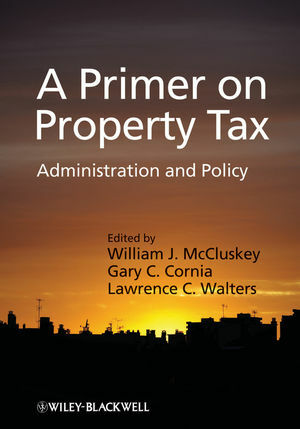 The authors examine the criteria applied to evaluate the strengths and weaknesses of property tax, discuss the main valuation methods and the economic principles underpinning them and review the legal and administrative aspects of property tax worldwide. William J. McCluskey is Reader in Real Estate and Valuation at the University of Ulster, where he received his Ph.D. in Real Estate Valuation in 1999. He has held various international positions including Visiting Professor of Real Estate at the University of Lodz, Poland, Professor of Property Studies at Lincoln University, Christchurch, New Zealand and is currently Visiting Professor in Real Estate at University of Technology, Malaysia. His main professional and academic interests are in the fields of real estate valuation, developing automated valuation methods and property tax policy. In addition, he has been an invited instructor in real estate at the African Tax Institute and the Lincoln Institute of Land Policy: China Programme. He is a faculty member of the Lincoln Institute of Land Policy and founding board member of the International Property Tax Institute. Gary C. Cornia is the Dean of the Marriott School of Management at Brigham Young University. He is the past president of the National Tax Association and has served as State Tax Commissioner in Utah. He has been a visiting Fellow at the Lincoln Institute of Land Policy and a visiting Scholar at the Andrew Young School of Policy at Georgia State University. He has published a variety of articles on state and local tax policy, decentralization, and property tax. He received his Ph.D. from The Ohio State University. Lawrence C. Walters is the Stewart Grow Professor of Public Management at the Romney Institute of Public Management, Brigham Young University. His teaching includes courses on land and real estate taxation at the Institute for Housing and Urban Development Studies, Erasmus University Rotterdam. He has over forty publications on public policy and management topics, several of which have received national awards for excellence. He has just completed a property tax policy guide for developing countries sponsored by UN-Habitat and a book on managing “wicked” environmental problems. He received his Ph.D. from the Wharton School at the University of Pennsylvania.